The findings, published Feb. 11 in Nature, provide insight on how the brain creates a map inside one’s head. 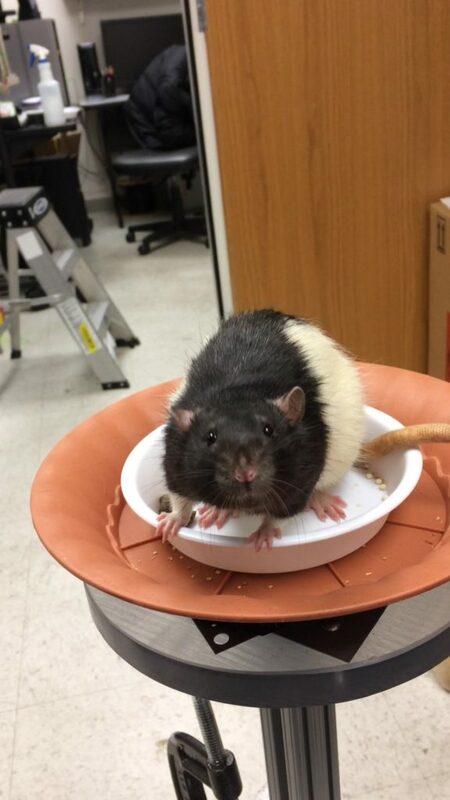 One of the study’s rats. The study’s findings add additional evidence toward how memories, inherently grounded in time and space, are formed. “We know that the hippocampus in humans is involved not only in spatial mapping, but it also is crucial for forming conscious memories of our daily life experiences,” says James Knierim, a neuroscientist at Johns Hopkins who led the study along with mechanical engineer Noah Cowan, also of the university. Because spatial disorientation and loss of memory are one of the first symptoms of Alzheimer’s disease—which destroys hippocampal neurons in its earliest stages—these findings can further research efforts to understand the causes and potential cures for Alzheimer’s and other neurodegenerative diseases. This research was supported by NIH grants R01 MH079511, R21 NS095075, and R01 NS102537, a Johns Hopkins University Discovery Award, a Johns Hopkins Science of Learning Institute Award, a Johns Hopkins Kavli Neuroscience Discovery Institute Postdoctoral Distinguished Fellowship and a Johns Hopkins Mechanical Engineering Departmental Fellowship.